(Nanowerk News) The humble cup of tea has long been regarded as a cure-all for the hustle and bustle of modern life. 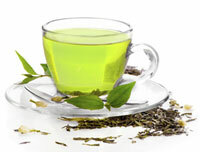 Now, researchers from the A*STAR Institute of Bioengineering and Nanotechnology have identified another benefit of tea — they have successfully used a major component of green tea, a catechin derivative, as the basis for a delivery system for anticancer drugs ("Self-assembled micellar nanocomplexes comprising green tea catechin derivatives and protein drugs for cancer therapy"). To overcome this problem, Ying, along with Joo Eun Chung, Motoichi Kurisawa and other co-workers, have designed a drug carrier that possesses therapeutic effects. The scientists identified a catechin derivative in green tea known as epigallocatechin gallate (EGCG), which has documented anticancer effects, as the most promising carrier candidate. They used EGCG as the basis for 90-nanometer-diameter micellar nanocomplexes to deliver the anticancer protein drug Herceptin directly to tumors. The researchers did this by oligomerizing EGCG and then binding it to Herceptin, which formed the core of the micellar nanocomplexes. Finally, they formed the outer shells of the micellar nanocomplexes by binding polyethylene glycol–EGCG to the cores. The team then tested the anticancer efficacy of the micellar nanocomplex both in vitro and in the body against a human breast cancer cell line and compared it with that of free Herceptin. The results were encouraging. “The carrier-delivered protein drugs significantly reduced tumor growth and were more effective against tumors than the drug by itself,” Chung reports. Cancer is not the only potential target for this drug delivery system. “EGCG binds to many biological molecules, such as proteins, peptides and genes, and this is responsible for its many beneficial activities,” notes Kurisawa. In particular, EGCG is known to be beneficial for cardiovascular and metabolic health; it also exhibits anti-HIV effects as well as neuro- and DNA-protective effects. “Our green-tea-based nanocarrier has the potential to deliver a variety of proteins, genes or drugs to improve the treatment of other diseases besides cancer,” remarks Chung. The team now intends to conduct clinical trials so that it will benefit cancer patients.